ProductCampNYC was a fantastic event where I met likeminded individuals and enjoyed a day that’s dedicated to the amorphous blob of a role/function that is the Product Manager. I highly recommend going if it’s offered in the future! One of the key elements (perhaps arguably the key element) of effective project management is proactive and compendious (my little word of the day) communication with all stakeholders involved. I have been in many situations where I was in charge of multiple streams of work for multiple clients and initiatives. Keeping things straight in a high intensity environment with multiple klaxons going off makes it difficult to keep issues and stakeholders lined up to be resolved or simply informed. 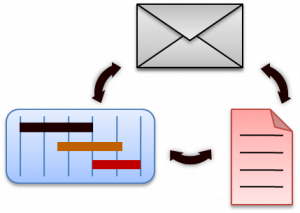 I came across the following article recently about a project management tool that was supposed to emphasize usability, but there was no mention of integration with diagrammatic (eg. 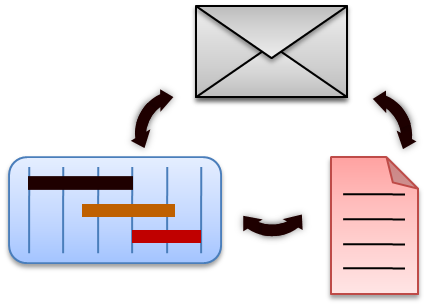 Visio, MindManager) or communication (eg. Outlook, Lotus Notes, Gmail) tools. Why hasn’t someone come up with this?